1931. 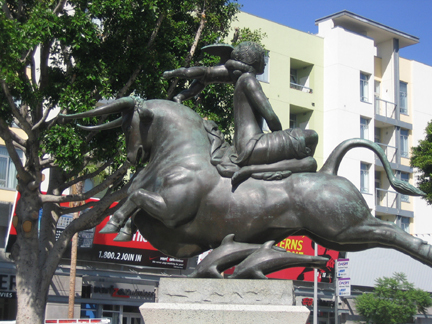 Paul Manship, corner of Sunset and Vine, Hollywood. 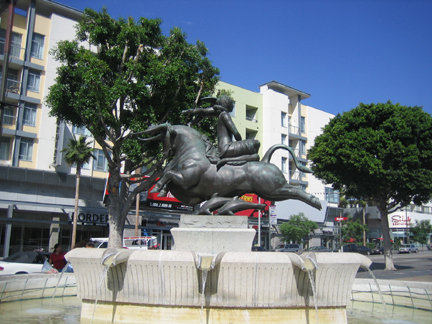 The plaque on the street corner by this sculpture reads: On this coner in December 1913 Hollywood was born with the filming of the first full-length feature movie, The Squaw Man. For 26 years this famous corner was the symbol of another entertainment medium, as NBC broadcast to the world from radio and television studios located here. On February 15, 1954, the Hollywood Chamber of Commerce and the Hollywood Radio and Television Society recognized the importance of Sunset and Vine by choosing this site for the entertainment industry's time capsule, to be removed from beneath this plaque and opened February 15, 2004.